1/2 oz. 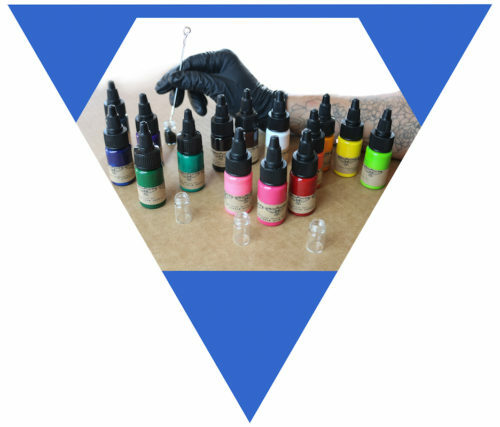 (15mL) Professional sterile tattoo ink (v)//colors now available//Get. Artsy. 5 Sterile tattooing needles (3RL+ 5RL+ 5RS+7RL). Pro’fesh equipment. 1 Mini glass ink jar Recycle/reuse this cutie! 1 Packet natural aftercare balm (v) – Vegan & petroleum free. Care for yourself. 1 Sterile witch-hazel wipe. Calm the swelling with herbs. 2 Medical gloves (nitrile, latex free). Protect yourself. 1 Sanitary absorbent mixed fiber cloth. Wipe up! 1 Large sterile bandaid. Cover up! 1 Soaker pad. Soak it up! 2 Sterile alcohol wipes. Sterilize! Stencil paper and StencilStuff (v). Don’t F*#k it up! 1 Medical surface covering. Stay sanitary. Instructions, hints, ideas in our ‘zine on How to Tattoo Safely. Brush up. Our kit packaging and contents are biodegradable, compostable or recyclable as much as is possible. We avoid using petroleum products, however the medical industry requires some plastics for sterility purposes. We attempt to source things locally that are made in the U.S. under union or labor contracts. Both the buyer & the user of the kit must be at least 18 years old. Our paypal settings require the account holder to be at least 18 years old. Please read the Sales Agreement here. No returns or refunds, however we will attempt to solve any issues that our customers may have with the product. Just contact us. Read more Stick & Poke related topics on our blog. Our Partner Kits include double of almost everything! 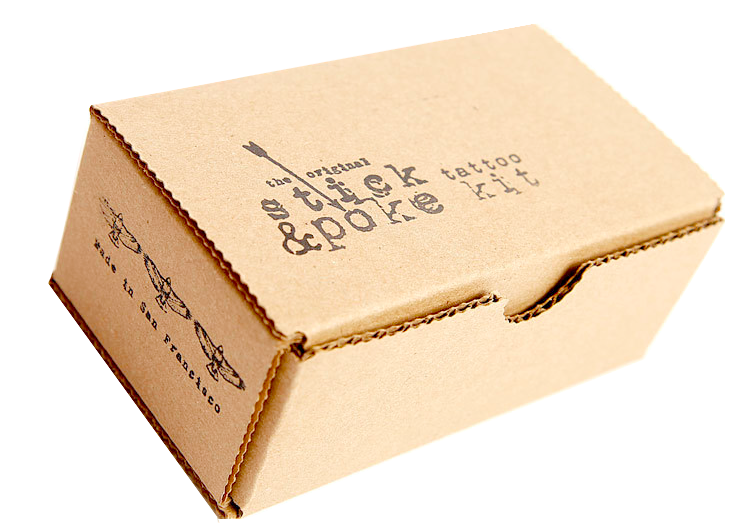 & our Expert Kits are for second time kit buyers who have our booklet and experience in stick & poke and want more harder-to-get supplies, needles or colored inks. We now have a practice kit (NOT FOR USE ON HUMANS) just for practicing and also we have a party kit made for five!